Create tight rhythms, harmonies and melodies in moments with MASCHINE - the groundbreaking instrument that combines a pattern-based sequencer, professional sampler, multi-effect unit and VST/AU plug-in host with tactile control. Experience a fully creative workflow with the integrated hardware/software system, combining the flexibility of computer-based music production with straightforward, two-handed control for composing, performing, browsing, sampling, slicing, sound-shaping and tweaking effects. MASCHINE is constantly evolving; the latest 1.8 free update opens up even easier integration with the world of KOMPLETE. Browse and load the plug-in presets of all KOMPLETE 8 Instruments and Effects from within the MASCHINE hardware browser - without ever having to touch your mouse or keyboard. Make MASCHINE the centerpiece of your studio set-up. With direct access to all software functions via the intuitive hardware, you can easily browse, load, tweak, play, arrange, and automate all sampler, plug-in and effect parameters with full hands-on control. With MASCHINE you can also control and sequence all of your external hardware instruments, or switch to MIDI mode to control other software. Once your track is ready, drag and drop your patterns as MIDI or audio files directly into your DAW to finalize and mix your production. You�ll soon realize MASCHINE is a powerhouse capable of revolutionizing the way you make music. If you are a user of iMASCHINE - NI�s on-the-go beat sketchpad for the iPhone� and iPod touch� � you can import your iMASCHINE projects to MASCHINE to finish your ideas in your home studio. MASCHINE is the ultimate performance tool for creative musicians. The controller is super-sturdy yet easily portable, the highly responsive pads and 11 endless rotary knobs are addictively playable, while the two backlit displays keep you informed of what's going on - even in the most demanding situations. Use MASCHINE as an instrument and/or MIDI controller for performing your own tracks, or sync it with other gear like TRAKTOR PRO 2 to add more dynamics to your live set. Perform with MASCHINE once, and you'll never want to leave home without it. 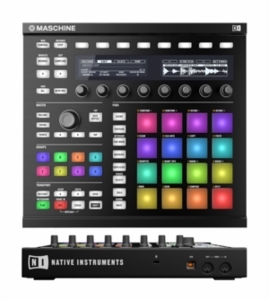 MASCHINE comes with over 6 GB of ready-to-use, professional and inspiring sounds. Create rhythms and melodies right away with the included drum kits, one-shot samples, basses, synths and acoustic instruments - all fully tagged for easy browsing. MASCHINE now also includes KOMPLETE ELEMENTS worth $59 / 49 �, providing more than 1,000 stunning sounds drawn from the flagship KOMPLETE 8 and KOMPLETE 8 ULTIMATE, opening a world of styles and flavors ready for use in your productions. Thanks to the 1.7 update, you can browse, load, and play KOMPLETE instruments in MASCHINE. And now, you can add extra fuel to your MASCHINE with the new range of MASCHINE EXPANSIONS - premium sample kits created by renowned sound designers and artists.